Tacheles 3D online art gallery has now a new foundation. The new construction of the art house Tacheles in 3D is in full swing. The first exhibition is almost set up and the artists of Tacheles have soon the oppurtunity to present their works in the Tacheles 3D online art gallery. There are already nomerous works of art to be seen from 3D internet artists and the foundation of the online Tacheles stands. The plan was to have the online Tacheles in 3D standing on the closing day of the real Tacheles. 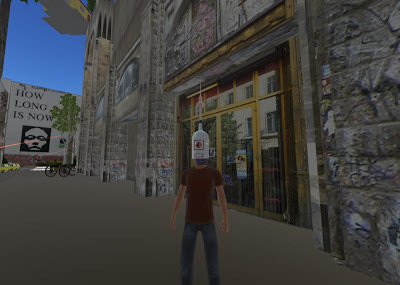 But since we moved our 3D Tacheles on a completely new webbased 3D software we need some more time to complete the new more detailed 3D reconstruction of the Tacheles building. In the morning the 4th of September 2012 was the Art House Tacheles in the Oranienburger Strasse finally evacuated. The open and free cultural space is now closed forever. A new beginning: The new 3D Tacheles art house and online gallery. Since a long time artist and programmers from Berlin are working on the virtual reopening of the new Art House Tacheles 3D. Wednesday is the house of Tacheles beeing imported. Until then there is art beeing collected and there are already things to be seen. Free and anonymous or direct Facebook Login here. Ohne Spenden ist das Projekt nicht möglich! Offene Gruppe Tacheles 3D Impress. Powered by Blogger.